How about an artistic coffee-table guide to Funko Pop! Vinyl figures? It's Funko's World of Pop! Volume 3 Hardcover Book! Spans licenses from The Walking Dead to Tim Burton, and more. If you can't get enough of those cool Pop! Vinyl figures from Funko, this Pop! Vinyl World of Pop! Volume 3 Hardcover Book is just the thing for you. An artistic approach to the world of Pop! 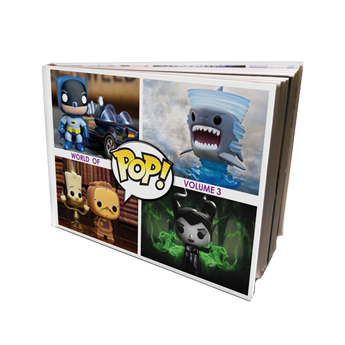 Vinyl, the high-end coffee-table guide will walk you through Funko's wonderful line of charming figures that span licenses from The Walking Dead to Tim Burton films, and the Alien series with fabulous photographs of Pop! Vinyl figures in various settings and backgrounds. This fantastic collection is an ideal gift for fans of Funko and its Pop! Vinyl figures.